Bookwhen has developed an industry unique feature which allows franchisors to automatically take commission per transaction from their franchisees. 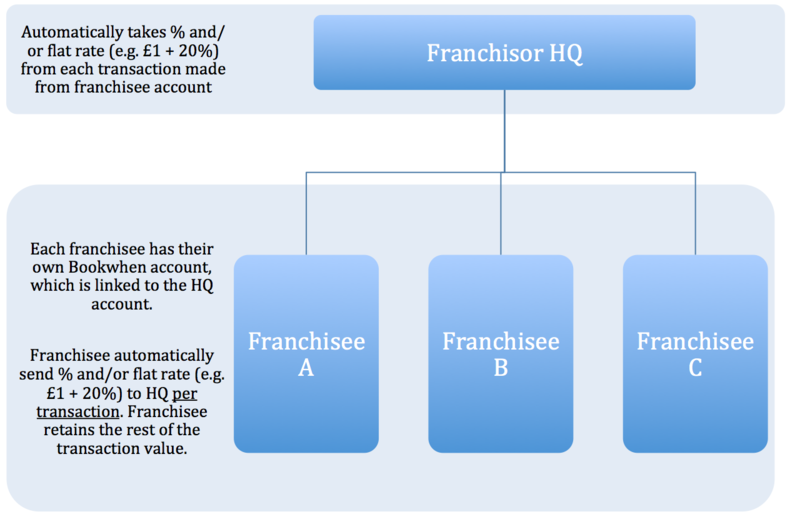 The schematic below demonstrates how the relationship between the Franchisor HQ Bookwhen account and the Franchisee Bookwhen accounts works. For each transaction a pre-determined fee (set by the HQ) is automatically taken from the franchisee account and passed to the HQ account. We're currently helping several national franchisees scale rapidly using this feature, and we're very excited to offer this off-the-shelf function for any interested franchisor. Please get in touch at support@bookwhen.com to arrange a call.